So, you are all set to take the van somewhere and your worst nightmare comes true……. you can’t get the 13 pin plug to plug in to the socket on the tow vehicle! The biggest problem with the 13 Pin plugs is that people don’t understand how they work and what bits twist and what bits don’t. 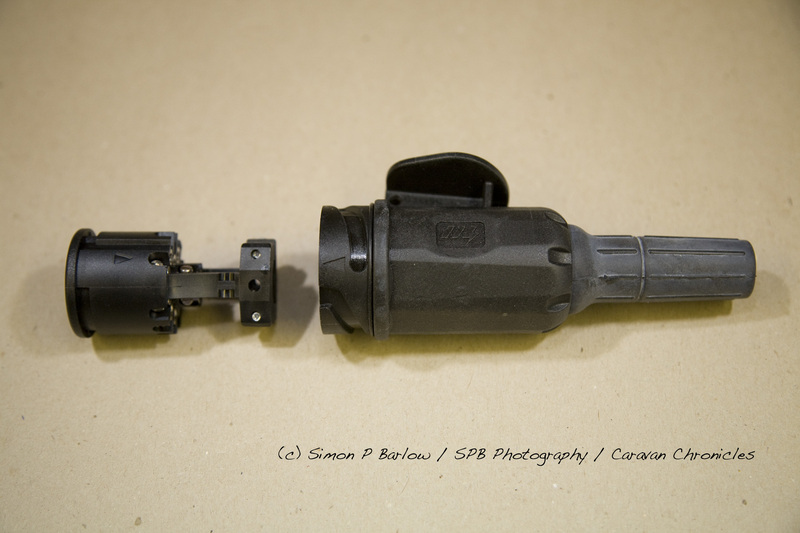 I have put together here a few photos showing how a new plug fits and what bits twist. The three components that come in a 13 pin plug pack. The photo above shows the three bit’s that come in the packaging when you buy a new plug. Now if you have bought your caravan and it already had a 13 pin plug fitted, there is a fair chance you have never seen the green bit on the left. Well without this, you cannot “reset” your plug or take it apart. The second reason the green cap is included is it’s a fully sealed cover for the pins. If you look inside, you can see a rubber ‘o’ ring to make a dust and waterproof seal. Note, in the photo, the cable grip is in its “open” position which allows better access to the terminals for making the individual cable connections. 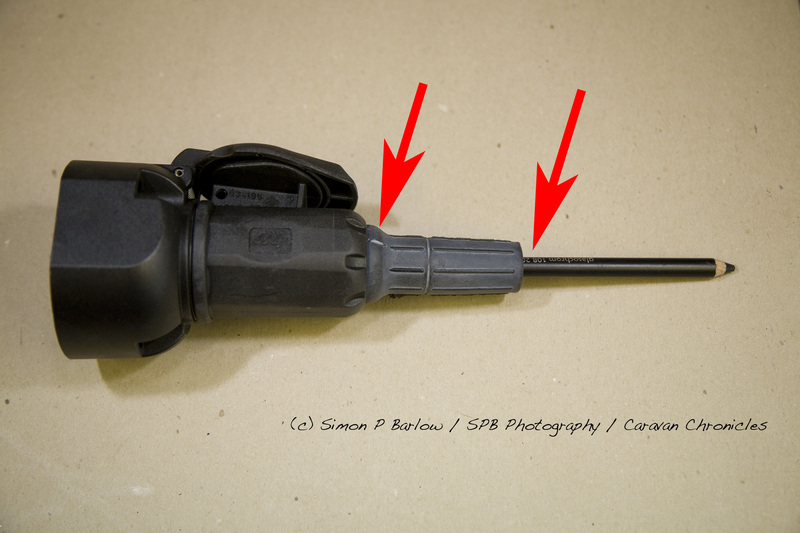 The cable entry gland or shroud is the lighter colour section to the right hand side of the plug body, it’s made of a flexible rubber so that it provides a tight seal on the cable. If you are assembling a plug for the first time, it can be quite difficult to get the 11 core cable through the gland as it’s designed to be a tight fit. Cable soap on the cable will help. 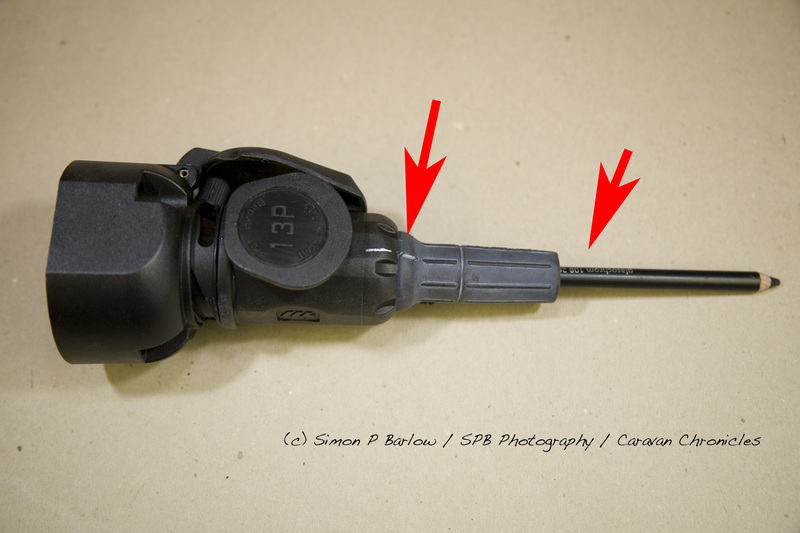 The photo above shows the position of the cable grip when the plug is ready to be assembled. I have not used a cable at this point as to show how the plug works, I wanted something that could not flex or rotate, so I used a pencil. If you notice, I have taken care to line up the writing on the pencil with the moulded arrow on the core section. The reason for doing this will become apparent shortly. 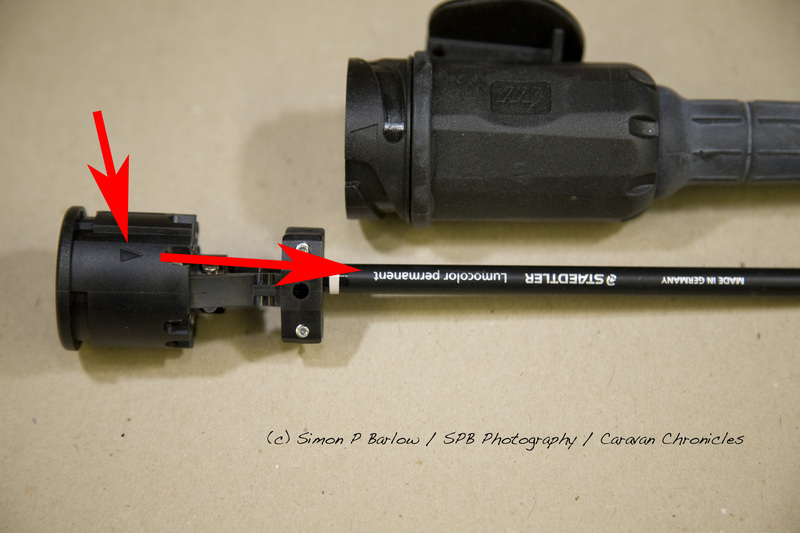 To insert the core section carrying the pins into the housing, the two arrows that are moulded into the plastic (shown above) have to line up…. and this will allow the core to slide past little “pips” moulded into the plug housing. These pips are important, they allow the housing to rotate around the core section. Understanding that the housing rotates not the core carrying the pins is important. Now we can see (above) the plug ready for final assembly. The inner core has been inserted into the housing, but not pushed all the way home yet. You can see how the two arrows and the writing on the pencil line up. This is important. In the picture above, you can see the writing on the pencil is still in the same position as before, and still aligned with the arrow on the inner core of the plug. What has changed now is the outer housing has rotated around the inner core and cable (or pencil in this case) to the correct position. This is the final assembled position and is ready to be plugged into a socket. The housing rotates around the core and it rotates around the cable gland. The white mark on the gland is still aligned with the writing on the pencil. It is designed to do this. So now when you are plugging in your 13 pin plug into the socket on the tow vehicle, think of it like this. The pins, the cable and the cable gland are all one solid piece and the only way to connect them is to line up the pins, then rotate the housing round them. What if the plug won’t line up correctly with the socket? This is where you need your green cap or alignment tool. It takes a bit of getting used to, but line up the green cap with the centre section of the plug. You only have to put the cap on a few millimetres, now holding the cap steady, twist the plug housing… you might have to check which way it needs to turn by turning it gently in each direction. You should feel a bit of resistance then it should ‘pop’ over the pips. One of the biggest causes of the plug becoming mis-aligned is “plugging” it into the moulded receptacle in the ‘A’ frame fairing. Effectively, you are twisting the plug around to insert it and as the cable is quite thick and the moulding does not have an insert to stop the inner twisting the wrong way, you inadvertently mis-align the plug housing and inner core with this twisting action. It’s not that the plug has a design flaw, it’s that the moulded section on the ‘A’ frame fairing to store the plug is not correct. A far better way of keeping the plug safe is to use the green cap for what it was designed for… keeping the core and housing aligned ready for use and protecting the pins from the environment. All wet lubricants are sticky to some extent and will hold grit and dust. The core of the plug that contains the electrical pins should be free to rotate and if it’s binding, it should be investigated why. 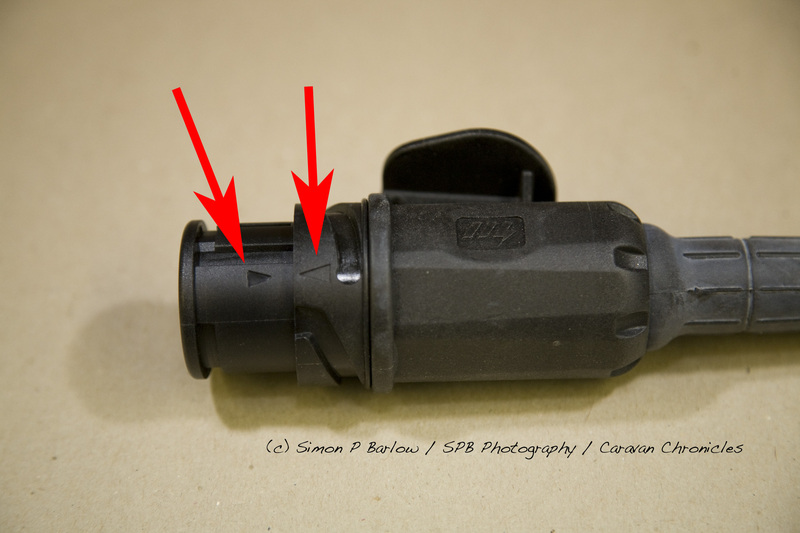 One of the most likely causes is that the cable clamp has not been tightened down equally and one side is higher than the other, this will bind on the inside of the plug housing. The core section should not normally need any lubrication, but if you feel it does, use something like Tri-Flo (you may have to search for it). It comes in two forms – as an aerosol and as a light oil. The aerosol version is the only lubricant I’d recommend for 13 pin plugs. I have used T9 Boeshield which is an aviation product (made by Boeing) with similar properties but is very expensive. The rubber cable gland has a flange moulded into it that fits inside the housing of the plug body. Again, a tiny amount of lubricant here will allow the body and gland to rotate freely. Remember most lubricants are conductors to some extent, so don’t flood the plug with lubricant. Some people think that it is necessary to cover the screw terminals in grease or Vaseline or some other paste to protect them. In a quality plug, the contacts will be nickel-plated and the overall protection of these plugs from water ingress is a lot better than the old style, therefore I wouldn’t recommend it. Besides… it is always worth every season, just opening the plug up and performing a visual inspection. If you find you need to replace the rubber ‘O’ ring on the plug, you can buy them via the well known auction site or from people like Screwfix Direct (selection box of O rings). The size is 40 mm diameter and 1.5 mm diameter cross section. If you have difficulty in getting them, try these guys… Polymax look for 40X1.5N70 – you will have to buy 15 of them though! I hope you found this useful and it solves your 13 pin plug puzzle! There has been some speculation on some forums that using the green cap will promote condensation in the plug and some people have received advice not to use the green cap. My take on it is this; The wide spread use of the green cap is fairly recent. In fact the official UK MENBER importer did not import green caps as a separate item until after the post above was written and I had emailed Menber in Italy and the UK importers to see if they could import the green cap on it’s own. Up to then, it was only ever supplied with the 13 pin plug in a blister pack for retail sale. So I don’t think that there is a lot of history in using the cap and people suffering condensation issues within the plug. Caravan manufacturers didn’t even supply the green cap with new caravans. If the plug manufacturers considered that condensation would likely lead to problems, I think the cap would have been designed with a ventilation hole in it and they would not go to the expense of installing a neoprene seal in the cap. In fact, to save money, they could just supply a simple plastic ring designed for assembly or disassembly of the plug. The electrical pins in the plug (and socket) are all nickel plated, which is an improvement on the brass contacts of the previous designs of trailer plug. If you look at the construction of the plug and socket, the tracking length of a mated 13 pin plug and socket is far greater than the tracking length of the 12N and 12S types. 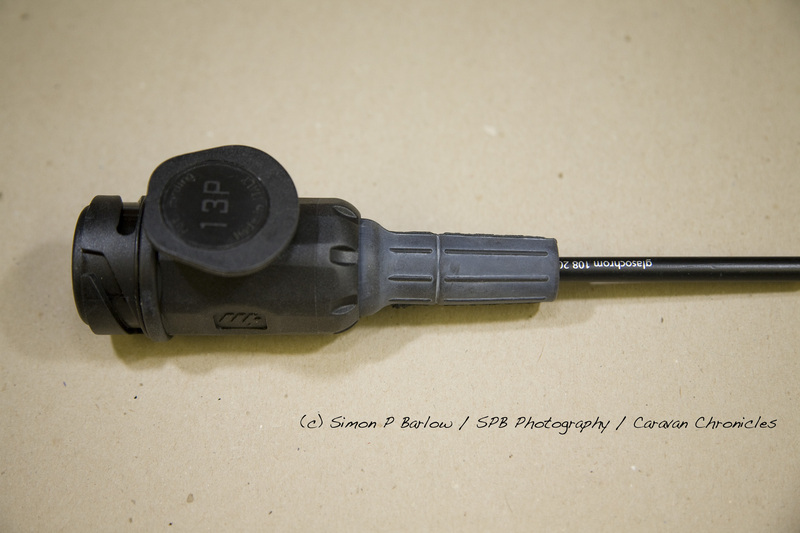 I remember 15 or 20 years ago one of the accessories you could buy for the 12N socket on your car was a rubber or neoprene ‘boot’ that fitted over the socket to help protect it from the elements… there was also a matching ‘cap’ that fitted over the end of the 12N plug. I don’t recall anyone advising us not to use these as it could promote condensation and corrosion of the electrical pins. Mind you, there wasn’t the internet back then so information was much harder to come by. When I converted the Freelander over to a 13 Pin system, I also converted my small trailer over as I didn’t want to use an adaptor. My trailer has sat outside for 18 months in all weathers with a green cap on the plug, and this evening I went out and had a good look at the plug. No sign of condensation. So, after all that… what’s my take on it all?…. well, lets just say I put the green cap back on my trailer plug. My 13 pin plug would not fit in today as misaligned. This article explained why. I got a 13 to 7 pin adaptor “free” with by towbar bike rack that came with a 13 pin plug – as not required I cut out the placement lugs in the side with some wire cutters; inserted the 13 pin plug into the pinholes- rotated until the outer casing was in the right place. Pulled out and inserted into the socket in the car. Sorted. Thats a handy top tip for everyone! Thank you for this excellent explanation of this problem which I have experienced myself. I now have a green cap which I carry with me and always use when not towing. A wonderful explanation Thanks!! Is there anywhere you can buy the green cap without buying the complete plug? I have not yet found any of the major suppliers that supply just the green cap. I have however emailed Maypole to ask if they can source and package the green cap from Menber and release it out to their distributors. Unfortunately, I haven’t heard anything back from them. As soon as I can find a reliable source of good quality caps, I’ll post it on my blog. Hi Chris, you’ve probably found out already but you can buy the green caps on eBay for about £5 including postage. I had a similar experience the first time I tried to connect my ‘van this year. After a lot of struggling and head scratching I eventually managed to plug the van into the car socket but the whole body of the plug was about 45 degrees out of its normal position. I tried all the ideas on the various websites but found that in my case the problem was not with the plug but with the socket on the car. The inner “core” had twisted some 45 degrees clockwise which gave me the problem. I removed the socket and managed to relocate the core into the correct position and problem solved. 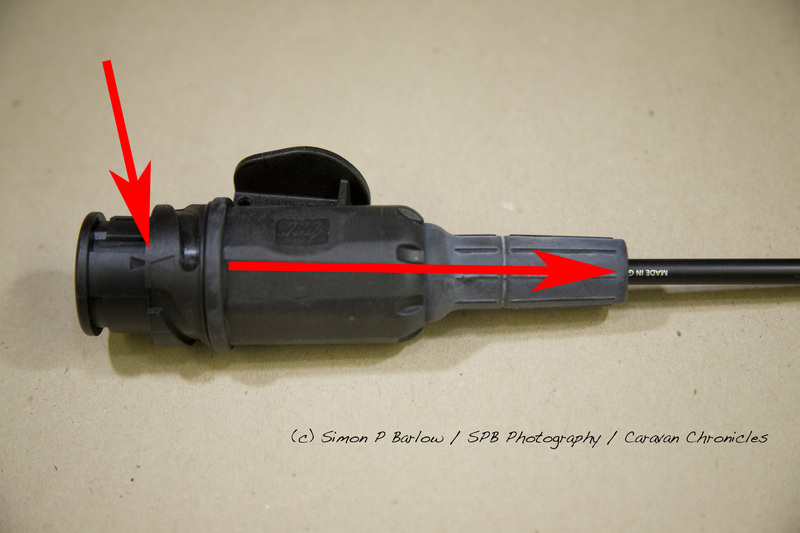 The 13 pin socket on my car is the one that came with the genuine Ford wiring kit for my S Max so I doubt if I am the only person who will have the same problem? Funnily enough I’ve had a couple of Ford owners email me in the last few weeks reporting the same problem. They commented that the socket didn’t seem as good a quality as their previous Ford fitted sockets. May be one to watch out for as you say. I found this blog because I Googled to find if anyone else was having a problem with 13 pin plugs. I took delivery of a new caravan last week and immediately went off to try it out for the weekend. The weekend was brilliant as was my new Sprite Musketeer, however I wasn’t prepared for the event that almost spoilt it all. On the Sunday we packed up to leave and then found I could not connect the 13 pin plug. It took us over half an hour by which time I was thinking I would have to leave the van behind. I tried asking other caravaners still on site but they all had the old plugs. Eventually my daughter managed to make the connection but she didn’t know how apart from the fact there was a lot of brute force involved. I can not understand why I have not read anything about this problem in the Caravan Club magazine or anywhere else. Thanks to this blog I now know why I had the problem. I don’t have the green cap but found I can twist the inner core by using the cable. Not ideal but it works until I can source a green cap. Thanks for the help. Green cap available at “tool Box”, http://www.thetoolbox.uk.com .Just received it, so haven’t tried it yet. It cost £2.20, but £3.80 delivery. Description – 13 Pin Plug parking Sockey-Assembly Tool. Thanks for posting that, it’s been difficult tracking who is now stocking them. I spotted them for sale in Glossop Caravan’s shop last week as well, around £3.49 each I think. We are new to caravaning and we have been having a lot of trouble with the misalignment of the plug. We have just purchaed a green plug from Leisure Sales at Brereton near Sandbach for £2.20 but there are no instructions and I have no idea what to do with it !! any help would be much appreciated. The 13 pin plug just takes a bit of getting used to and the thing to remember is to always fully turn the plug on connecting and disconnecting. If you turn the plug anti-clockwise and pull it will disconnect, but not in the proper position. The plug will virtually disconnect itself if turned fully anticlockwise. As the cable from the caravan to the plug is so thick, you can sometimes turn the outer section of the plug when you don’t mean to and it will make the plug very difficult to plug in. In order to ‘reset’ everything back to how is should be you need to use the green cap. Now there is a bit of a technique to this. The idea is to use the green cap to hold the centre of the plug – the bit with all the pins in – in one position. In order to do this, you have to line the green cap up with the centre section of the plug, look where the keyway is on the edge of the centre section and line that up with the square recess in the edge of the green cap. Don’t push the green cap on to far… it only needs to go on a few millimeters. I find it is best to put it on at a slight angle. Now with the green cap holding the centre section of the plug in position, turn the body of the plug anti-clockwise and you will feel the body of the plug turn and a slight bit of resistance as the outer cover ‘clicks’ into the locating slot inside. To be honest, it takes a bit of faffing about . However……. I have an alternative! Another way to try this is to hold the cable in your left hand with the plug pointing away from you (as though is was a spray on a garden hose) and with your right hand turn the body of the plug anti-clockwise. The cable and centre of the plug are clamped together and can’t move – it’s the body of the plug that rotates around the cable and centre. Once you have it back to the ‘starting position’ you will see the green cap fits on about one third of the way. If you now hold the green cap in one hand and turn the plug body clockwise with the other, it will pull itself like a screw into the green cap and click into the fully engaged position. To take the cap off, just hold it firm in one hand and turn the plug anti-clockwise with the other. Turn it fully until you feel it click and the cap will simply come away. One of the biggest problems I see is with people not fully turning the plug when disconnecting and turning it part way then tugging on the plug to get it to unplug from the car. They then have problems when they come to plug back in. When you disconnect the plug from the car, always put the green cap on as it protects the plug and keeps it in the correct position. Sorry its so long winded…. it takes a few minutes to write what I could show you in 30 seconds! I hope it helps. Just experienced my first 13 pin plug problem, and not a green cap in sight. It is possible to take the plug apart in a muddy field in the rain and re-align the pins with the outer ring bits. It took us about 30 minutes but we got there in the end. Must buy a green alignment thingy. It’s frustrating when it happens, but it sounds like you got it licked – well done! 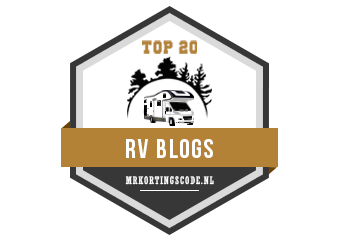 Having experienced the annoying ’13pin plug won’t fit’ I found your inputs to Caravan Talk very informative and extremely helpful – thank you. I duly ordered the Menber plug and socket and set about replacing first the socket – without any problems and then I started the plug. The old plug, without a name but fitted to my new Sterling Europa, was defunct the inner sleeve refusing to move. Comparing the new and old plugs led me to check the fit into the new socket with the new plug, so without any connections being made I partially screwed the cable retainers, inserted the inner into the outer and was confident that all was well as the inner rotated as you have described. Further testing with the green reset tool also confirmed it was working OK, removing the plug from the socket I then set about preparing to connect the cables – but I was unable to retract the inner from the outer. Despite checking alignment and the freedom of the inner and outer to rotate, and with access to exert finger pressure through the cable entry space onto the inner I am unable to press out and remove the inner!! Can you offer any help or advice as I am now minus a 13pin plug on my caravan. The outer sleeve rotates round the inner section between two stops. To disassemble the plug, you have to actually rotate the sleeve past one of these stops and that will allow the inner section to be pushed out from the outer sleeve. 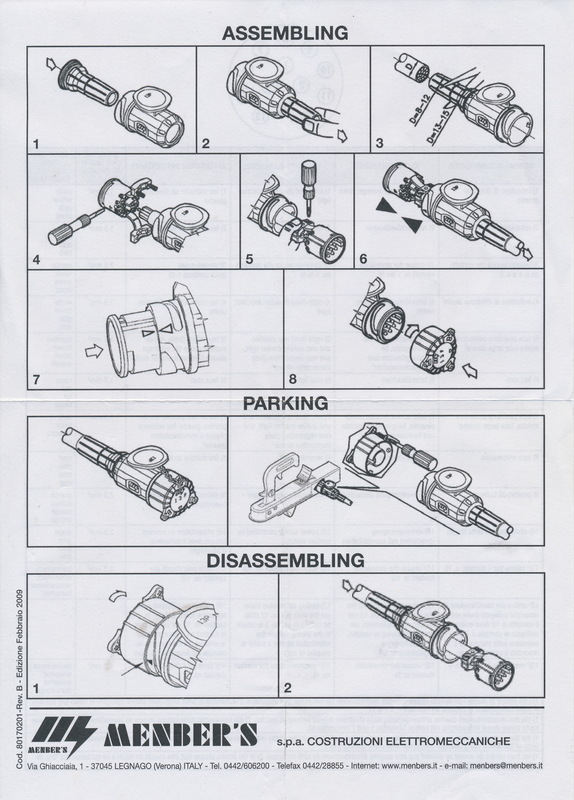 If you look at the photos above of a disassembled plug, you will see that there are two alignment arrows to help with assembly. What you have to do is turn the body of the plug backwards. The easiest way to do this is hold the plug as though you were going to plug it in to the car. Now align the green cap so that it holds the inner plug section, but don’t fit it in too far, now turn the plug body anti-clockwise. What you are effectively doing is turning the outer body back over a small locating pip so there will be a little bit of resistance. If you look at the fourth photo down, there are two red arrows drawn on the photo, just behind the left arrow head is a slot on the inner section of the plug. It is this that needs to line up with a pip on the inside of the outer body so it can be disassembled. When the plug is assembled, this pip runs round the groove around the circumference of the inner section, the stop point can just be seen as a tiny rectangular ridge where the lateral groove meets the circumferential groove. Sorry the explanation is a bit wordy. I hope it helps. If it is powering up the ATC unit power is obviously getting to the van from the vehicle. I am not sure how the interior light for the fridge is powered in all conditions. I suspect it will run from the leisure battery when the fridge is set to gas (no EHU) I don’t think it would be powered via the vehicles 12 volt battery with the engine off, so this might be misleading. With the engine running, it probably will be powered via the vehicles system as the habitation relay should have isolated the rest of the van. Have you tried disconnecting the leisure battery and seeing what’s powered up when connected to the vehicle (no EHU obviously)? If the tow vehicles voltage is below 10.9 volts, the control system will not allow power to be drawn from the vehicle, have you checked the tow vehicle voltage by pressing the button in the centre of the vehicle indicator? If the power is turned on and the vehicle battery level falls below 10.9V a warning beep will be heard and the vehicle battery gauge 10V LED will flash. To cancel the warning, press the levels button. If you turn off the power switch then turn it back on, any warnings will be repeated. Sometimes the control panel software can crash…. it needs a quick reboot. Turn off the PSU isolate switch and wait 30 second, then turn on again. I think that this one may be a call/e-mail to Ian at Sargents electrical http://sargentshop.co.uk/ 01482 678981 they are really helpful guys and will be able to sort out any problems quite quickly. Hi all i wire these up and yes were a pain to start with, you want to try getting cable through first, really difficult without silicon spray. now have a van with this plug and no green cap and had trouble when picking up van, service man came with his cap and sorted, but doesnt help when home. have found them on amazon seperate but expensive for what they are. It sounds like the mechanic doesn’t have an appreciation of how the plug and socket work. Once inside, the cables are fairly tightly packed, but the secret is not to have each individual cable too long, just cut to the correct length with the right amount of insulation stripped back, and work from the inner pins outwards. Don’t try to rush the job. it looks daunting at first, but take it one step (or cable) at a time. Hi when making either the plug or socket up i’ve had to have the cable made in colour order the way the pins are. Very first time was very difficult twisting them to fit. Now they go round in order and just have to get the right end to socket or plug as one is opposite to other. Still tight and fiddly to do. Plug is very tight and cable hard to get thru gasket. Just dont cut inner colours too short as thats even harder to make them reach. Need to twist back using green cap, get it on the very edge and twist anti clockwise. Then will have to push hard the cable back thru while pulling the centre bit with pins. They come disassembled and i make them up but thats just the reverse of how i assemble them. Great description thanks Chris, have just had my CRV converted to 13 pinnedness and tried, (all excited) to couple up my new Lunar Lexon with ATC yesterday afternoon. Posted in Caravan Talk forum and got some really helpful replies, including a link to your excellent description. Will have a second attempt today but have a green cap on order, so looking forward to getting connected. Thanks again. Sorry Simon, the above was meant for you, just turned 60 and it’s showing already. Just wanted to let you know that I tried again today and all went well. Ended up partially dismantling the van socket and scoring a tiny nick with my fingernail on the rim of the inner, in line with the point of the arrow, which is covered when assembled. Thanks for the detailed instructions Simon, made things much much simpler to understand. I please that you found my ‘ramblings’ helpful too! I queried a problem with my RH indicator not flashing last week. The outcome was that an Approved workshop mechanic wanted to remove three metres of caravan cable and attach a new plug and cable because he claimed the plugs are so fiddle and complex to repair. Also he wanted £90 to do the job so I told him to stay at home. I called my caravan dealer and he is going to check and do any necessary work FOC! Whilst on the subject another chap suggested checking the car socket. Well what a surprise, the socket was full of water and the RH indicator was not receiving any power. The socket was removed by my garage and the mechanic said there was water inside the cable too. Now the caravan plug still is in need of attention and that will be done tomorrow. This is the first time in over thirty years of caravanning that I have ever seen so much water inside a car socket, the screws were rusted solid too and one of the screw heads fell off when we touched it. All is well with the socket now and I was impressed with the pocket sized lights function tester which us apparently used in MOT tests to check your lights are working. Just spent an evening trapped at in laws as could not understand why it now refused to fit. 10 mins in costa this morning on wi fi . And this article to the rescue. Was beginning to question sanity, couldn’t fathom why a perfectly good connection earlier in the week was now impossible. Hopefully I can get back and sort. Many many thanks ! I found the fastest method is to mark up the pieces with a permanet marker, I have marked at the top opposite the locating bit. I just pull off the outer sheath, lign things up and push it on again, it should locate in the two grooves. No green thing or guesswork required. What an excellently written and extremely helpful article! Used my more modern caravan for the first time last week, and had a very frustrating time plugging in the electrics! I could see what was happening, and after a few minutes why, but getting around it – groan. This article really helped, and I now have the green alignment tool, can’t wait to have a play next time we go out! 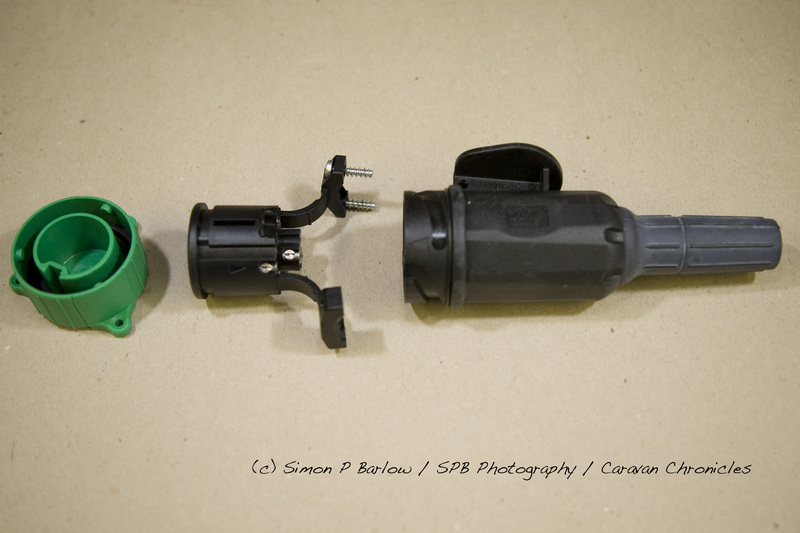 I’ve just bought a Menber plug and green cap with a view to replacing the seven pin plug and adapter I’m currently using to connect my trailer to the 13 pin socket on my car. 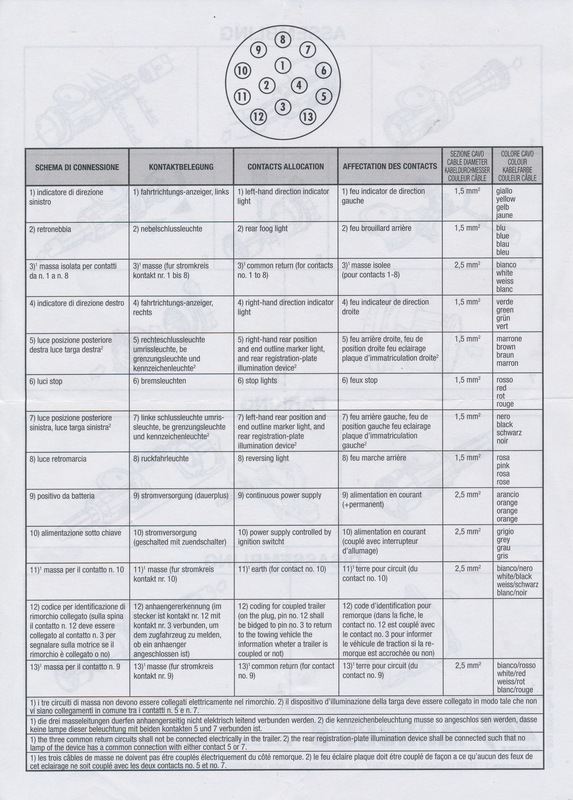 However I do think that the second page of the Menber instructions you’ve posted above are somewhat misleading as the diagram of the pin numbering in the context of wiring a plug would make you think that you could use this as a visual guide while wiring the plug, i.e. the lower right hand terminal on the plug is pin 13. But it’s not, it’s pin 12 as the diagram shows the layout when viewed from the front of the plug, not the back where you’d actually be connecting the wires. So you need to have a mirror image of this to hand when doing the wiring (see the diagram in your help guide here – https://caravanchronicles.com/guides/understanding-caravan-and-tow-car-electrics/) so that you can compare terminals to the diagram location rather than having to mentally swap them round. Or have I got it wrong? Hooray, even I understood this! Saved our holiday!